Notes: Based on the 2009 visual novel game of the same name. This series was temporarily streaming on crunchyroll's website, but is no longer available. Okabe Rintarou is a self-proclaimed 'mad scientist' who invents 'Future Gadgets' in a small 'lab' in Akihabara above an old electrical goods store with his hacker friend Daru and atrociously cute childhood friend Mayuri. After an incident it turns out one of his inventions really does work - it can send text messages through time. Don't worry, I groaned too. It's a pretty natural reaction to one of the most hackneyed, ill-used and ill-regarded clichés in the writers' handbook. You've seen it done, I've seen it done, within animé and beyond it but don't stop reading here and definitely do not give up on watching this. I'll explain why. This show isn't about time travel. Yes, it is there and it is the key component of the narrative but this show isn't about that. It's about Okabe Rintarou. Science fiction as a whole can be summed up to be about at least one of three things: the technology, the society or the individual. Steins;Gate falls firmly in the third of those three. Time travel is a catalyst to drive the characters together and in this intention I can find no fault. I'll get back to that in a minute. I want to talk about aesthetics first. To be fair to this series; time travel has never looked so good. The almost sun-beaten streets of Akihabara are evocatively bleak and form a pristine but strangely foreboding backdrop to the proceedings, almost too clinical but also too fuzzy to be comforting. This is not Durarara's carnival of the night with lights, sleaze and glitz but more like the cities I've lived in personally - lifeless but ever moving, like sand in the desert wind. It evokes some of my favourite moments of Serial Experiments Lain where Lain would walk through the morning streets in the shadows of the power lines. It's not a surprising comparison when you take into account that both directors have worked on Yoshitoshi ABe drawn productions before including SE Lain itself and they certainly knew their trade back then. 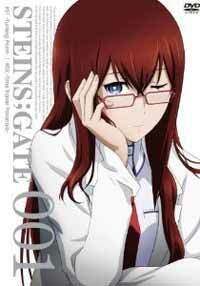 Steins;Gate proves they have not lost their touch. In this respect it seems pertinent to consider the directors themselves. Hiroshi Hamasaki (of Shigurui and Texhnolyze fame, amongst others) and Takuya Sato (of Ichigo Mashimaro fame, amongst others) seem like an extremely odd choice for collaboration taking into account the former's history of uncompromising almost nihilistic drama and the latter's history of the most pleasant of comedy but it's certainly a combination that worked. Unrelenting bleakness would not have suited the series and Sato's characteristic light-heartedness perhaps might have been too soft for the intent but somehow both styles seem to have met and melded with an astounding synchronicity. A lot of animé have a jarring jerkiness when they shift between light-heartedness and deathly seriousness but Steins;Gate manages to move between them seamlessly. It's not quite the pitch (black) perfection of Masaaki Yuasa's mocking, flesh-stripping gaze but it's amazing that the director of Texhnolyze and Shigurui and the director of Ichigo Mashimaro can come together in such perfect synthesis. To be honest, I'm still astounded how well the comedy present mixes with the more serious plot elements. The key to this has to be the characters. The characters, like the plot, will seem atrocious if I break them down individually: the childish, nonsense spouting but occasionally brilliant Okabe; the fat, perverted but kind-hearted Daru; the Tsunderish genius Makise; ditsy childhood friend Mayuri; the scarily androgynous doormat Ruka; and so on, but that might just be the point. One criticism I've heard levied and have some sympathy for is the complaint that Okabe is really annoying. I can see that, he is at the beginning. The thing is... he changes. They all do. Some shows have their characters defined within minutes and never waver but, as I said before, this isn't about the comedy; it isn't about the angst or a crazy, mind blowing science fiction world laden neck deep in symbolism. It's about a group of friends, alienated from society at large, that make a time machine and how that affects their lives and relationships. What makes this worthwhile though? What makes this strange bunch worth watching over twenty-four episodes? I'll tell you in one beautiful phrase: damn good writing. To be honest, I was surprised. Okabe and Makise, in particular, are individually unimpressive characters. I do not know everyone's take on tsundere characters but I am not overly fond of them; they are at best cliché and at worst despicable, and Okabe's over the top weirdness and ramblings can be just as tiresome yet somehow together these two characters have real chemistry. Their bickering is genuinely amusing and their intimate moments are genuinely touching. It is in these things every major character is redeemed in my eyes. A childhood friend is at least as clichéd as a tsundere but through Mayuri's and Okabe's interactions; what they talk about and even the way they look at each other, the childhood friend tag actually means something. There is history. All this does not come without a price though. The gentle build up of characterisation is effective but slow. The first half of the series, while still very entertaining, seems to lack a little bit of direction while it builds up steam. Also Okabe really is embarrassing to watch earlier on in the show especially before he has Makise to call him on it (which happens mercifully quickly) but it really does take the show time to start building his character to a meaningful level and the wait can be a little tiring. In the end it is a sacrifice that I'm willing to make. In exchange for a slow build up and an irritating lead I get a pitch perfect turning point and a thrilling climax that must be amongst the most satisfying endings in science-fiction animé history if not animé in general. We get relationships we can invest in and we get characters that properly progress through beginning, middle and end. It's a show that takes us somewhere. It might not be anywhere that deep but it is affecting, fun and deeply enjoyable. Recommended Audience: Teens and up. There is some violence, a reasonably complex plot and some adult humour from Daru.